spring roll for a delicious vegetarian dinner idea. 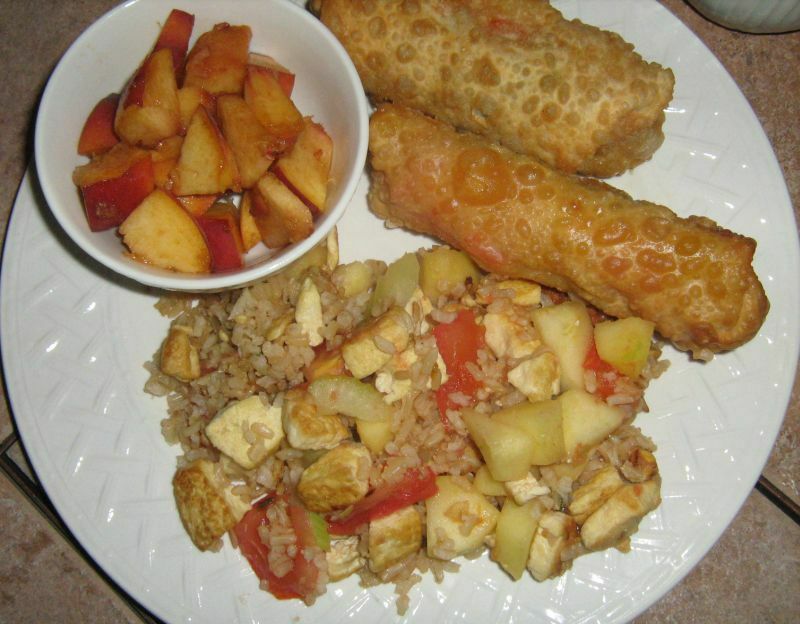 This Apple Fried Rice is a tasty fried rice variation, and combined it with egg roll or spring roll it makes for a deliciously different meatless meal. While the egg roll wraps are not vegan, you can purchase rice paper wraps and, using the same method, make spring rolls. We originally planned on the spring rolls, thinking we had rice flour on hand. We didn't. However, a quick trip to the market did score us the egg roll wraps. The apple fried rice with egg roll recipe takes a little time to prepare but the result is a delicious blend of flavors that yield a satisfying meal! See our tips for the secret to great fried rice! In a large skillet or sauté pan heat 2 Tbsp. of olive oil on medium-high heat. Add the celery and cook for another 3 minutes. for another 3 to 5 minutes until rice mixture is heated through. Reduce heat to medium. Add the diced tomato and apple. Cover and cook until apple chunks are tender but not soft. In a second skillet, heat 2 Tbsp. olive oil over medium-high heat. Add in the red bell peppers and cook til crisp-tender, about 4 or 5 minutes. Add in the Daikon, carrots and bean sprouts and allow to cook until heated through - about 5 minutes. Remove from heat and allow to cool a little. Meanwhile, in a deep fryer or deep saucepan, heat the vegetable oil on medium-high. Drop in a piece of bean sprout to test. If the sprout begins to cook and brown almost immediately, the oil is hot enough. Lay the egg roll or spring roll wraps on a flat surface with a corner facing you. Place a small amount of chopped spinach near the bottom corner. Spoon on some of the veggie mixture. Roll the wrap, tucking the corner under the veggies and continuing to roll to the left and right corners. Fold those corners in to seal the ends and complete by rolling to the far corner. You can use a little egg-replacer mix to coat the last corner and "stick" it to the roll to seal it, or use a wooden toothpick placed into the roll to hold it in place. Using a slotted spoon, carefully place two egg rolls in the sauce pan and deep fry them until golden. Remove them with the spoon and place them on a double layer of paper towels to drain and absorb the oil. To make the dip for the egg roll, simply grind the black peppercorns to a coarse grind and place it in a small dipping bowl. Squeeze the juice from two fresh limes into the pepper. 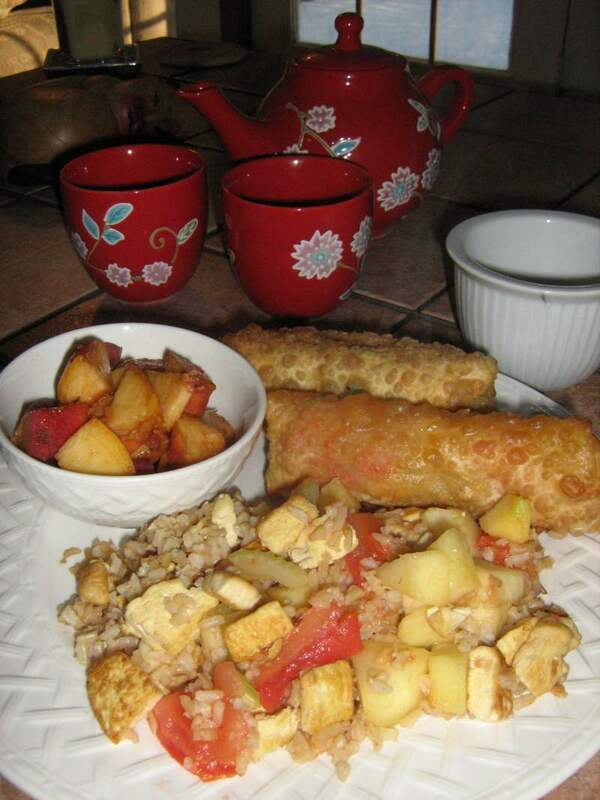 Place the fried rice and egg rolls on a serving dish along with some sliced fresh fruit and the dipping bowl and serve! The coarse dip for the egg roll adds an element of heat and a bite of citrus to the taste and is a pleasantly simple surprise!